Navan’s Matteo Cigala recorded a powerful win in the A3 race at the Newbridge Grand Prix on Sunday. Having tried on a number of occasions to break away from the bunch, the race was ultimately decided by a sprint finish. Jamie Noone (UCD) tried to break away with 500 metres to go, but Matteo was alert to the threat. Originally from Italy, where he started racing at the age of 6 and progressed to eventually represent the Italian national team, including at the Junior World Championships in Copenhagen in 2011. However, he retired from racing at U23 Continental level at the age of 20. After some time working and traveling through Asia, Matteo eventually moved to Navan and is now pursuing a degree in business studies. His love of cycling brought him into contact with the local club in Navan. With his excellent start to the season, few would bet against him. 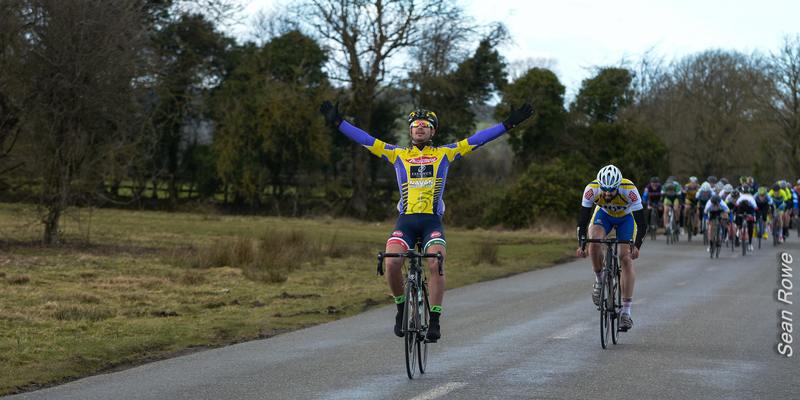 Photo: Matteo Cigala (Navan) celebrates winning the Newbridge GP.